6-1-18. I wasn't sure what to title this blog. An Event For Weirdos sounds a little, well, weird. But that's really what this event was about. I think all the weirdos that attended with me would agree. I am a member of the Traveling Museum of the Paranormal & Occult. This event was organized by the Museum for members only at a haunted asylum in rural Illinois called Ashmore Estates. I have investigated Ashmore 2 times previously but this event was like no other conference, ghost hunt, or paranormal experience that I have participated in. 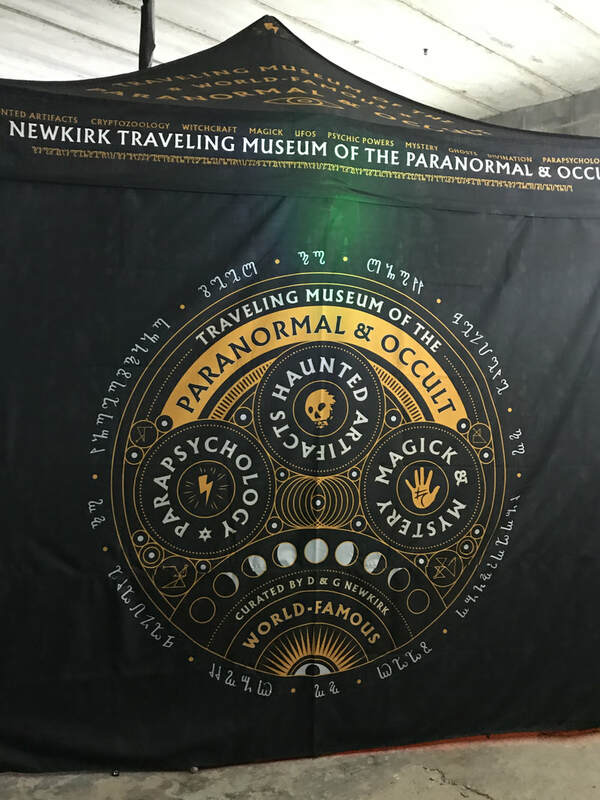 I first discovered the Traveling Museum a couple years ago at a paranormal conference. 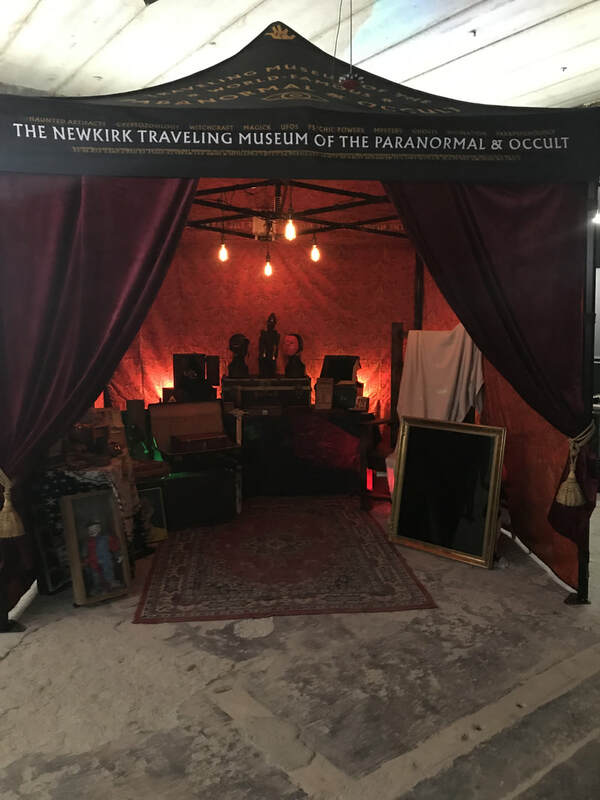 This museum travels to various events around the country with haunted artifacts that spectators can touch and interact with themselves. Greg and Dana Newkirk are the curators. The minute I heard what they were all about, I knew they were just like me. I investigate anything paranormal, ghosts, aliens, Bigfoot, anything out of the normal. In a world of paranormal enthusiasts that limit themselves to only one piece of the supernatural puzzle, these two were a breath of fresh air. I believe that all of these aspects of the paranormal are connected and so do they. Shortly after I discovered them, they launched a program for their Traveling Museum where anyone can become a member and receive various benefits. I have been a member since the very beginning. One great thing about this membership is all of us interact on a daily basis on the members only Facebook page and I've quickly become friends with other members. I found my tribe. We call ourselves weirdos. Although this is the name we have been called by certain not-so-nice-people sometime in our past or present, we now wear the title with pride. When it was announced there would be a members only event, I knew I had to attend. The tickets sold out in a few hours. Luckily for me Ashmore is only hours from my home but there were many people that flew in from all over the country to go to this gathering of the strange. The itinerary was kept under wraps right up until a week prior to the event. We were all excited to see what was in store for us and it did not disappoint. I attended with my husband, Joe. There were many people who came alone. This was a group that felt like family. Many people called it a family reunion. Going alone seemed like a very normal thing to do. Like I said this felt like no other event I had ever been to. We truly are a paranormal family. We were given a goodie bag when we arrived with various museum related items and a cool pin that can be worn to other events so that we can identity other members of the museum. The first part of the event took place on the second floor of the haunted building where guest speaker, John E. L. Tenney, gave a talk about supernatural topics and Greg and Dana spoke about the museum. All three of them are my favorite speakers at any conference so this was a treat. For the next phase of the weirdo gathering we broke up into 3 groups for an investigation into the past, the present, and the future. On the main level we gathered around a table with John Tenney who led an experiment reminiscent of old-school investigating. We all held hands, one person asked a question to the spirits, then the next person asked the same question, going around the circle until everyone had asked this question to whoever might have joined us from another realm, all being recorded on an audio recorder. During my session we heard a loud noise and everyone in the room thought it came from a different direction which was interesting. Another group said they recorded an EVP of a spirit saying the question they had asked, as if they were part of the circle too. Up one level was The Present. Connor Randall and Karl Pfeiffer joined us all the way from Colorado to show us the Estes Method, which they invented during their time at the Stanley Hotel, hence the name Estes which is the city the hotel is located in. During the Estes Method one person is blindfolded and wears noise cancelling headphone which are attached to a spirit box. Another person asks questions to the spirits and the person with the headphones calls out any words they hear over the spirit box. Little did we know, another member was conducting an experiment on the third floor. Her name is Amy. Karl was listening to the spirit box and heard her name a couple times and felt a presence near him. The two experiments might be connected somehow. The third floor was The Future. We got to check out the new tent which houses the current artifacts on display for the Museum. It was reminiscent of a fortune tellers tent and was so awesome. The pictures don't do it justice. Go see it in person at an event near you. You can find out where they will be traveling next at the Museum website. After perusing the haunted objects, we gathered down the hall to witness the craziest experiment I've ever witnessed. Dana strapped herself to the strangest "helmet" with all sorts of elements and cables running from it. This contraption is called The God Helmet. I had heard of it before but had never witnessed it. This device uses low intensity electromagnetic fields on certain parts of the brain to stimulate visions. There is more to the experiment which Greg and Dana call the Initiative but only Board Members of the Museum have been privy to this top secret paranormal research. ​It was exciting to be part of cutting edge paranormal research. This event was no "ghost hunt" which is typical for paranormal gatherings. This experience made you think of future possibilities in the paranormal field. I've wanted to participate in John Tenney's Seance ever since I heard about it a couple years ago when he began hosting them at various paranormal events. The only way to get invited in the past was to randomly get picked. This time everyone who was at the event got to participate. It was not like any seance I had imagined. No holding hands in a circle, no candles lit around a dark room. The experiment is "top secret." I can't tell you what the experiment is or the results because I don't know any more than I did about it before the seance even after experiencing it. So it still remains "top secret," even to this participant. I realize this review is vague. I didn't go into a lot of details because I think everyone should experience this group for themselves. Being a member of the Traveling Museum of the Paranormal & Occult is truly like being part of a family. Many of us in this field never felt like we belonged anywhere. We were different than "normal" people. This is a place where you can fit in and be yourself. Greg and Dana are the nicest people, appreciate every person who supports their dream and take you along for the ride. If you have any interest in the paranormal check out the membership page. You might just find you belong with the rest of us weirdos.